Welactin for Dogs & Cats nutritional supplements for dogs and cats offer a rich source of Omega-3 fatty acids derived from salmon and other cold water fish. Welactin pet meds are a direct source of EPA and DHA, and they help maintain skin and coat health. 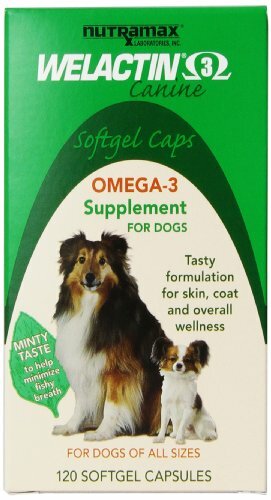 Welactin Soft Gel Caps for Dogs are the tasty, easy to give Omega 3 fish oil supplement you dog needs for optimal health. Omega 3 is shown to benefit brain function, kidney function, vision, skin and coat health. Welactin has no side effects. 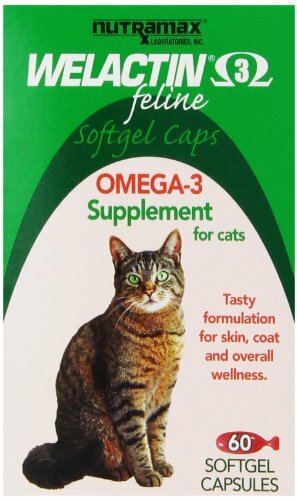 Welactin soft gel caps for cats are rich in omega 3 fatty acids, which help promote healthy heart rhythm, kidney function, resilient immune system function and soft, luxurious coats. Welactin Cainine is a rich source of omega 3 fatty acids derived from cold water fish. While using Welactin Canine, look for an improvement in your dog's general appearance, activity level, attitude, appetite, and alertness. Directions: Add to your dog's food once a day according to the chart or as directed by your veterinarian. What is Welactin? Welactin is a specially prepared salmon oil manufactured to maintain a high content of Omega 3 fatty acids in a very tasty form for your dog. What are Omega 3 fatty acids? Specific fatty acids known as Omega 3 fatty acids are the good health fatty acids that you may have read about for human heart health. The two predominant Omega 3 fatty acids are docosahexaenoic acid (DHA) and eicosapentaenoic acid (EPA). Welactin will help my dog. Welactin Feline Liquid is a quality fish oil supplement for cats with a high level of omega-3 fatty acids beneficial for strong immune systems, skin and coat health and nervous system support. Handy pump dispenses just the right dose. Welactin is a palatable, specially formulated product designed to support the overall wellness and health of your cat during the aging process. Welactin is a rich source of Omega 3 fatty acids which have beneficial effects in the following areas: Kidney Health Helps support renal function Brain/Vision Helps support the nervous system Skin Health Helps support coat and combat dry skin Immune System Health Helps support immune function Many of Welactin's important functions are at work inside your cat's body. While using Welactin look for an improvement in your cat's activity level, attitude, alertness, and general appearance. Welactin Canine is a rich source of omega-3 fatty acids derived from salmon and other cold water fish. Welactin Canine provides high levels of omega-3 fatty acids to help support skin/coat health and overall wellness of your dog.Omega-3 fatty acids have beneficial effects by helping in the following areas: Skin/Coat Health: support healthy skin/coat Heart Health: support normal heart rhythm Kidney Health: support renal function Brain/Vision: support the nervous system and trainability Musculoskeletal: support joint function Immune System Health: support immune function In a palatability study, Dogs preferred their regular food with Welactin.Ingredients: Salmon oil, fish oil, mixed tocopherols, mono-and diglycerides, soybean oil, citric acid, and rosemary extract. Welactin is a rich source of omega-3 fatty acids derived from cold water fish. Welactin is formulated to deliver substantial levels of EPA and DHA to dogs. DHA and EPA have been identified as healthy fatty acids. Supports healthy skin and coat and heart rhythm. The 3 pack is great for multi-dog households. Welactin Canine 3 16 fl oz.